HDSP 9632 also supports the existing Expansion Boards (EXB). An internal ADAT input and an internal ADAT output allow for up to 14 analog inputs, 14 analog outputs, or the usage of a TDIF interface, directly inside the computer. Add a word clock module for one in and two outs! And / or add a TEB for an additional TDIF port! Add 4 analog inputs and/or 4 analog outputs! Add a TEB again for an additional TDIF port! OR use an older AEB-4i/8i/4o/8o for up to 14 analog inputs or outputs! HDSP 9632 + WCM + AI44s-192 + AO4s-192 + TEB = all operational at the same time, occupying 1 PCI and 4 more bracket slots within the PC - There's no stopping now! * The HDSP 9632 ships in a basic version including two RCA/phono breakout cables (headphone: TRS jack). Therefore all analog I/Os and the SPDIF I/O are unbalanced. XLR breakout cables are available as an option (headphone: Neutrik TRS locking jack), turning analog and AES/EBU into balanced mode. DIGICheck 4.1 for Windows: Spectral Analyser, professional level meter for 2, 8, or 16 channels, Vector Audio Scope, various other audio analysis tools. Drivers: Windows 2000/XP (full ASIO multi-client operation of MME, GSIF 2.0 and ASIO 2.0), Mac OS X (Core Audio, Core MIDI). HDSP 9632 debuts SteadyClock™, a newly developed clock technology, combining professional features like maximum jitter suppression at full varipitch capabilities and software controlled sample rates. The optional 9632 Word Clock Module provides a galvanically isolated word clock input and two word clock outputs via BNC jacks. Compared to the well-known DIGI96/8 series, the HDSP 9632 not only offers a further improved analog interface, but also all the features of the award-winning Hammerfall DSP series: All inputs and outputs simultaneously available, MIDI I/O and TotalMix, the DSP-based realtime mixer/router. Hardware updates through software and driver updates are risk-free thanks to the Secure BIOS Technology. 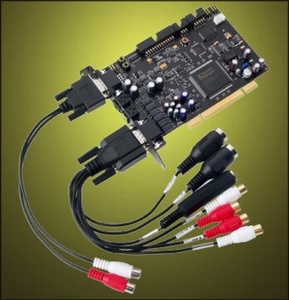 In short: The HDSP 9632 is the ultimate audio interface for PC or Mac, digital or analog. More details can be found in the HDSP 9632 manual ! Intelligent clock control according to operational mode and present/desired sample rate. The most reliable receiver circuit for ADAT optical signal. Scalable computer load according to the current usage. Monitoring of the input signal, independent from clock mode and sample rate. Professional status and level display at lowest CPU load. Measurement and display of all incoming and used clocks. Change latency on-the-fly under ASIO, without manual reset or re-boot. Automatic BIOS replacement when flash process fails. Surveillance and sample accurate synchronization of all channels. Comparison and display of all input clock status. Mixes all inputs and all outputs on all outputs. Several independent submixes possible. Automatic monitoring of the input signal with zero latency. A complete overview of all the unique technologies in the Hammerfall series can be found here.